Greetings from the gang here at Lucky Stars- this is our 2009 Christmas Card photo- Wishing all those who check out our blog - a very Merry Christmas and Happy New Year!!!! See you with more postings in the New Year!!! 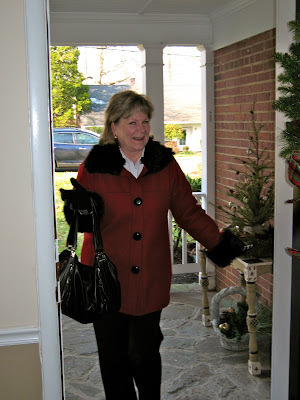 This is Nan- my dear friend and fabulous decorator. You may remember her from previous posts up in Maine. She and Kip visited this summer and did a great job with reorganizing and helping me pick out a few new pieces for the house in Maine. I thought I would pay her a little visit today and take a few shots of her gorgeous new house decorated for the season!!! Nan's chandelier - picked up on her world travels. 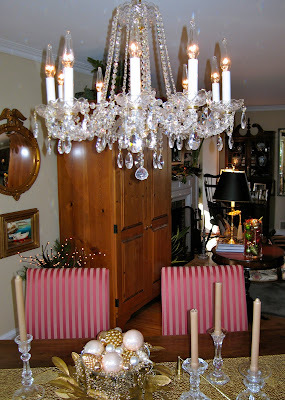 The dining room crystal candlesticks and centerpiece look great with it. Nan has had the chandelier since being stationed in Portugal but this is the first time she has been able to hang it - worth the wait! 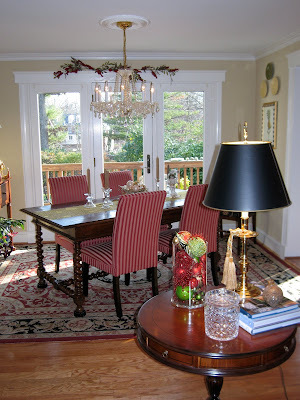 Again a total view of the dining room - her house is filled with light and is very open and airy-I love how she fills up glass containers with festive bulbs. Nice touch. 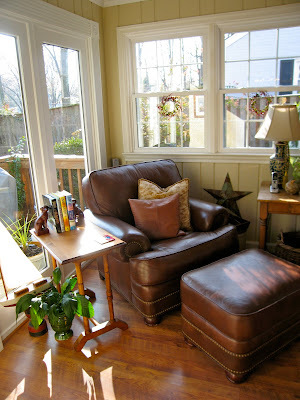 Her camelback sofa looks great- why did I leave my purse on there- way to ruin a pix! Looking in to the foyer. Nan's Dad built those bookcases on the right - they have found their way into all her many homes and always look fabulous. 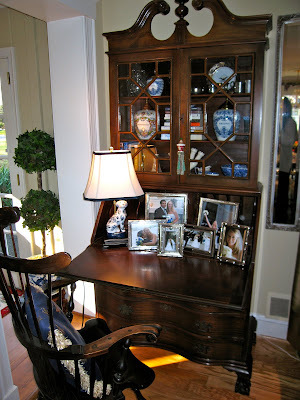 Close up of her secretary desk- silver framed pictures of family spread about- love how she blocked this entry to the attached family room - making the other opening the main one. Good way to manage the flow and create two separate spaces. 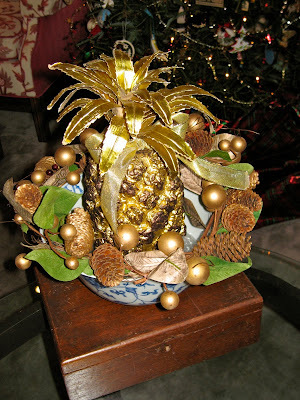 Close up of a golden pineapple - Nan finds little touches everywhere- and blends them beautifully!! When you think how many times she has moved and packed and repacked all these delicate objects!!! Its a wonder they have survived but with Nan's extra special care they do! Yea Kip arrives!!!! Maybe we can pay her fabulous home a visit next week!!! Love to blog about my dear friends! Nan's Dad also carves a folk art Santa every year. Such talent! And being a good friend for so many years I am lucky enough to own some of these beauties! His newest collector's item- A Penn State Santa!!!! How fabulous! WE ARE..... PENN STATE! 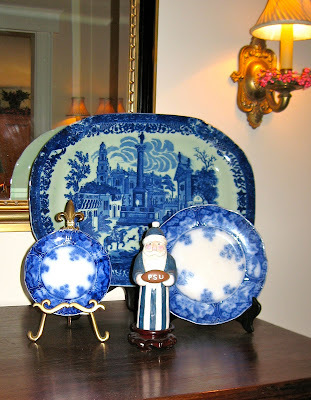 Not to mention the flow blue plates and large blue and white platter. 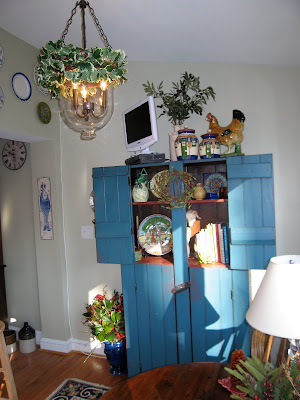 Sun streams into the kitchen - This blue painted cupboard is such a focal point in this room - Nan adds greenery and wreaths to deck out this area with the Christmas spirit. Love her new lantern light fixture, with a touch of holly! 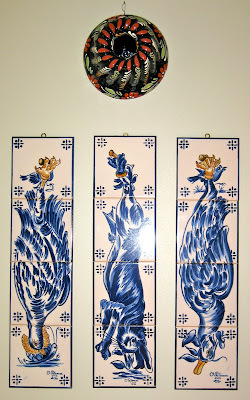 Portuguese tiles are just right on the wall of Nan's kitchen - you have seen some of my tile work at the Maine house in earlier posts! These rabbit and chickens are so typical Portuguese! The kitchen table looks out on her backyard. Her new Simon Pearce lamp blends beautifully with the warm wood. Notice the plate rack on the right and the angel wings with Christmas greens- very festive. ***** Nan mentioned that this table was a purchase when they lived in Portugal. Warm welcome in the foyer of the home. 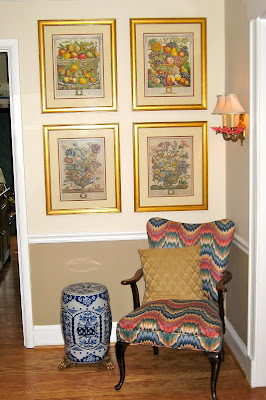 These 4 Williamsburg prints have found a spot in her house since I have known Nan. Every time they look like they belong! Love the "feet" on the blue and white garden stool. Here is a broader shot of the left hand side of the foyer- see what I mean about how perfectly Nan blends her pieces- Notice the mercury glass trees and peeking around the chest are more Portuguese tiles- a gorgeous floral piece on an easel. 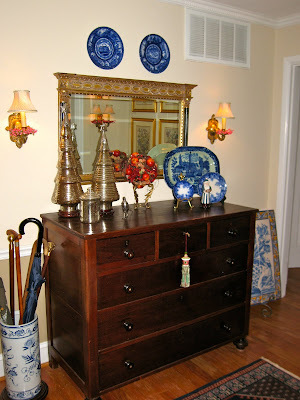 **** another addition from Nan- this chest was purchased in Portugal. Straight on view looking out the big front window. 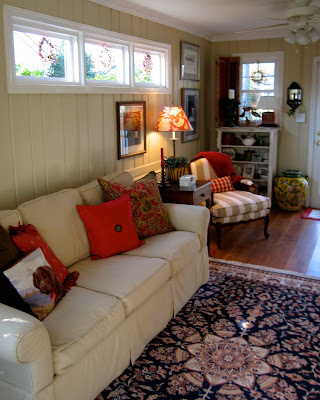 Love her red crewel wing chair - she has such a knack for blending prints and colors- always looks great. Back in the den a nice arrangements on a blanket chest- this room is very long and skinny - a decorating challenge that Nan has tackled masterfully. 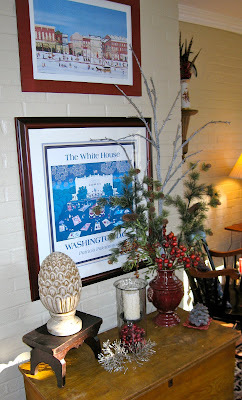 **** addition from Nan-The 2 prints in the family room are a local Alexandria VA artist, Patricia Palermino. Here you can see how narrow the room is- but look at the fabulous wall color-really looks great and lightens up what could be a dark room. 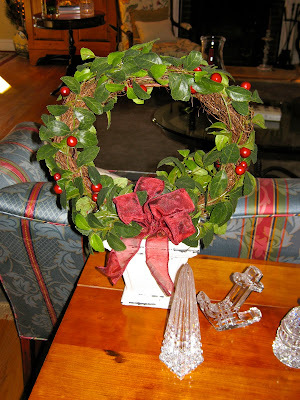 Love the small windows with festive wreaths. Overall view of the dining area from the family room- placing the dining table on an angle really gives the illusion of space and makes for easier access for diners and servers alike. Love her spool legged table. 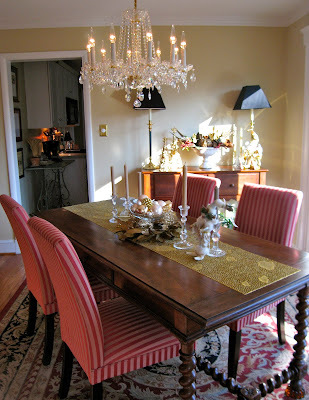 The hunt table in the dining room with natural light streaming in- adorned in gold. 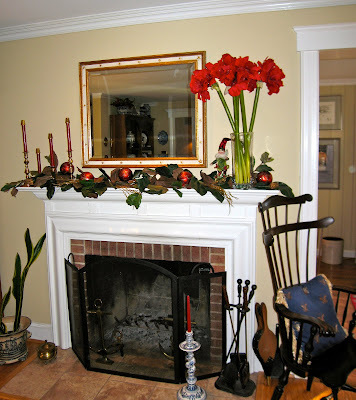 Better view of the fireplace- how about those silk amaryllis!!! 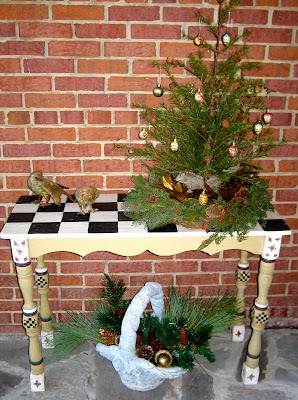 And the little elf brings a bit of whimsy to a very conventional setting. 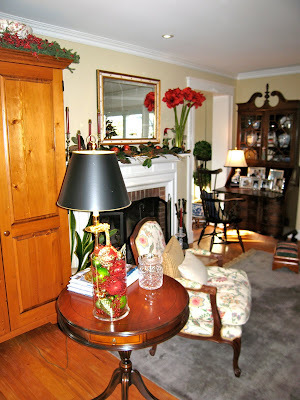 Here, Nan has moved the table that normally is in front of the large window to behind the camelback sofa- looks great with some touches of Waterford crystal and a festive topiary. Next week we hope to visit my other "Cohort in Crime" -Kip. Her beautiful home will be featured next week - get decorating y'all!!!!!! Hey P.S. everyone- want to see Nan's rooms close up ??? - Just double click on each photo- to enlarge!!! !